Congenital scoliosis is most easily described as abnormal curvature of the spine caused by birth defects. Due to a varied set of circumstances, which affect fetal development, the spinal vertebrae develop anomalously. In most cases it is thought that abnormalities begin as early as six weeks into gestation. Most often, one half of the vertebrae develop correctly while the other half does not. This is not the only form of CS but the most common. Sometimes vertebrae will fuse together (called a block vertebrae or unilateral bar) causing it to be very difficult for a scoliosis patient to move without pain or discomfort. When congenital scoliosis is present from birth, it causes the bones to grow without balance. The normal areas of bone continue to grow as in any normal skeletal system, but the deformed areas do not. This results in postural asymmetry which may be noticeable early on, but most often is spotted near the onset of puberty when growth happens most quickly. Some cases of CS are noticeable while the fetus is still developing, but this is rare. What differentiates Congenital from Idiopathic Scoliosis is primarily what shows up on an x-ray of a developing spine. In the case of Congenital, you can clearly see abnormalities in the bone itself. 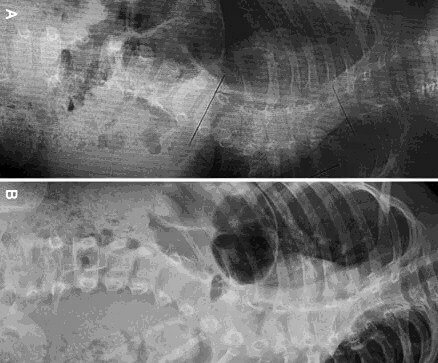 Detection of congenital scoliosis is often accidental, as when an x-ray is needed for another reason and abnormalities of the spine become visible. If a parent notices a child has an abnormal gait, one shoulder sits lower than another, or there are any bones which seem to protrude along the spine, in the neck and shoulders or in the hips which seems even slightly abnormal, it would be a good idea to have an x-ray or MRI to diagnose possible CS. Girls are more likely to have the disease than boys, but it can occur in both genders. An inability to walk or run correctly, or without pain. Small bumps or ridges my show up along the spine or near the ribs. Progressive challenges with any motor-driven activity. Surgery is currently the most common response to congenital scoliosis, but there have been numerous cases of exceptional improvement with more alternative methods of care, including yoga, spinal bracing, spinal traction, physical therapy, acupuncture and other healing modalities. In cases where CS is found in younger patients, doctors are noticing that allowing development of a larger chest cavity and lung size can help to support the spine’s growth as a whole. In many cases, surgery is not considered until a child reaches a certain level of growth. Earlier detection of congenital scoliosis gives many more options in its long-term treatment and the comfort of the patient.